Fake businesses listings on Google Maps and Google, in general, are a huge problem for small businesses. Virtual offices, fake locations, and lead generation companies are making it harder and harder for legitimate small businesses to rank near the top of Google search results. When these spammers and con artists take over the search results, nobody wins including consumers. Google’s own guidelines prohibit all these practices, and Google reports that fake listings have dropped by 70% over what they were in June 2015. However, Client Services Retention Manager, Erik Arndt, and others here at BizIQ are part of a growing group of people in the local online marketing community that includes popular Google commentators Joy Hawkins, and Mike Blumenthal who say that’s not true and the problems of fake listings and fake review spam on Google Maps has actually increased. That’s why Erik and the rest of BizIQ have made it our mission to rid the internet and Google of spam and fake listings. You don’t have to be in local online marketing to discover and report fake Google listings. Below are 10 common tactics that spammers, con artists, and shady businesses use to generate spam and, steal your business, and create fake listings. Often fake home service contractors will list their address as one where an actual local home service contractor is located. These fake contractors commonly use VoIP phone services, so the phone numbers they list look like a local number. Furthermore, these scammers often verify multiple locations on Google Maps using the exact same address and telephone number. Fake home service contractors impersonate home service contractors like locksmiths, plumbers, and electricians as a way for non accredited and/or unlicensed contractors to get unsuspecting customers to pay exorbitant rates for even a simple service such as being locked out of your home or vehicle. Abusive reservation services in the travel and food service industries will claim the Google My Business listing of a real restaurant or hotel. That triggers Google to send a verification postcard to the actual business. A few days later, the abusive listing service calls the actual restaurant or hotel and tricks someone there to tell them the verification PIN on the Google postcard. Often the person who created the fake listing, claims to be Google to get the needed information. With the PIN, the abusive reservation service easily takes over the Google My Business account of the real business by replacing the actual listing with their newly verified listing. The new listing then links to the abusive listing service where customers can still make restaurant and hotel reservations at the real businesses but must pay a significant transaction or reservation fee. Sometimes unethical business competitors might hijack another business’ listing in their same industry and area. They use similar practices to the ones that an abusive travel listings service might or register a duplicate listing and report the real listing as a duplicate. However, a more common issue is when a scam artist, unlicensed contractor, abusive travel company, former employee, or a malicious competitor simply edits your existing Google My Business listing by replacing correct information with wrong information. You might get an email from Google for some types of edits to your listing, but not always. In fact, anybody can change the address of your business in your listing. Everybody wants to generate leads and grow their business. There’s nothing wrong with that. As an online marketing company, we love to help our clients get more leads so they can grow their business. However, while that kind of lead generation is perfectly fine by Google, what they don’t want are shady lead gen companies dominating the Google search results or Google Maps. A lead generation company simply creates listings, websites, or ads to get contact information of potential customers that they sell to other businesses. In some industries, lead gen companies have completely taken over the top spots in Google Search and Google Maps, pushing out real companies, many of whom are small local businesses. Google doesn’t allow lead gen companies to create Google My Business listings, but that still doesn’t stop them. Again, this type of business is different from a marketing company that can create lead generation marketing campaigns that generate leads for your business. Google doesn’t allow businesses to register a business address that is a virtual office or a UPS or other mailbox store or PO Box. The address on a Google My Business listing must be an address where people can actually come to your business or an address where your employees are during your listed hours of operation. And by employees, they do not mean the employees of a virtual office company or the UPS store. This is a common tactic people think will work if they want to rank in another town, so they set up a fake listing at a virtual office. It’s not how local SEO really works, and it’s against Google’s guidelines. Believe it or not, there are actually forums where shady business owners and black hat SEO’s congregate to share tips on how to create these kinds of listings. During my research, I found a question from a person asking for advice on how to create a listing for their lead gen website that he made up a fake address for! Sometimes scammers will create a fake business listing but use the name of a real business in the same city. All the information for the business will be the same, except for the location. Another scenario is when a company wants to rank for a different city from the one they’re in, so they create another listing at either a virtual location or another address. Remember, Google doesn’t allow locations without an address or at a virtual office to have a listing with them. It’s also against their guidelines to create a duplicate listing for your business to improve your local search rankings for other nearby areas. Con artists can be pretty crafty when it comes to creating fake listings, and one practice is intentionally creating duplicate listings. Sometimes they hijack a real business and create a duplicate listing as we described in number 3, and other times they intentionally create a duplicate listing but at different addresses similar to the situation in number 6. Other times a business creates multiple listings for the same business because they think that will increase where they rank in Google search results. Intentionally creating duplicate listings is a blatant violation of Google’s guidelines and damages real businesses. Sometimes a business whether they’re a shady contractor, fake business, spammer, lead gen company, or scam artist will create multiple listings under fake business names that use VoIP phone numbers that all forward to the same primary number. Usually, they list false addresses or addresses that are virtual offices or a UPS store and are for seemingly different businesses but in an identical industry. Sometimes they might have variations of business names that are just keywords for the industry they’re targeting, for example, Best Plumber Near You. That’s probably not a real plumber, let alone the best one. This is a particularly scammy tactic and one that has definitely earned Google’s label, “miscreant,” because it causes a lot of lost business for small local businesses by pushing them out of the search results until somebody catches them and reports them and convinces Google to remove the listings as fake. It’s a problem that’s been going on for years, and it’s beyond frustrating that Google can’t seem to fix this problem or keep the same shady businesses from creating new listings once they remove the old ones. What about fake Google reviews? Our last type of shady Google practice needs its own section. Fake reviews are a huge problem when it comes to spam and misleading information in Google search results and on Google Maps. It’s another area where Google claims they’ve cracked down. However, Erik and others in the digital marketing community haven’t noticed less fake reviews and just like with other types of spam and Google My Business listing scams. Google doesn’t do the best job at fighting or removing fake reviews without the help of unpaid volunteers like Erik. In fact, when I did a Google search using the term, “buying google reviews,” I found paid Google Ads for companies who sell fake Google reviews. What the heck Google! It’s understandable that if you’re a small business owner, the prospect of a 1-star review might keep you up at night and you might be tempted to buy fake reviews yourself to try to bury a bad review or compete with any large corporate-backed competitors. You might not even realize, you can’t and shouldn’t buy reviews since there are so many companies who claim to specialize in SEO and online marketing who write and sell fake reviews. Afterall, Google allows them to advertise with Google Ads. But if you’ve been a victim of negative fake reviews or seen a competitor who buys fake 5-star reviews, then you know first hand the negative impact fake Google reviews and fake reviews on other sites can have on a small business. Even though Google displays their ads in their search results, and these companies even sometimes rank high up in Google’s own organic search results, Google’s own review policies do not allow fake reviews or purchased reviews. Google will remove flagged reviews they determine are fake, and they will suspend a business’ listing that they discover posts fake reviews. Hotel or Restaurant that redirects to a reservation site that charges a fee to book a room or table. Suspiciously Fake Reviews – e.g., A business regularly has large numbers of 5-star Google reviews on their listing in Google Maps, especially anonymous 5-star reviews, and reviews from the same person for businesses in 2 or more different states or countries. Do some additional research before you decide how to report these listings or expose them online. For some types of listings, you can submit edits to their Google My Business account within Google Maps. Google allows users to suggest edits on listings only from Google Maps and this option doesn’t appear in a regular Google search or on Google Chrome. But don’t just suggest edits without researching the correct answer first and in case your edit is denied, and you need to get help from the Google Local Guides forum or the Google My Business forum. In the Google report, we mentioned earlier, they claim that problems with fake listings are only at 0.5% but in reality, you can see that Google Maps and Google’s search results are plagued with the problem of spam and fake information. With Google making money off the advertising dollar generated by the shady companies who sell reviews and Black Hat SEO services as well as from Lead Gen company PPC campaigns, you might feel powerless to fight back. 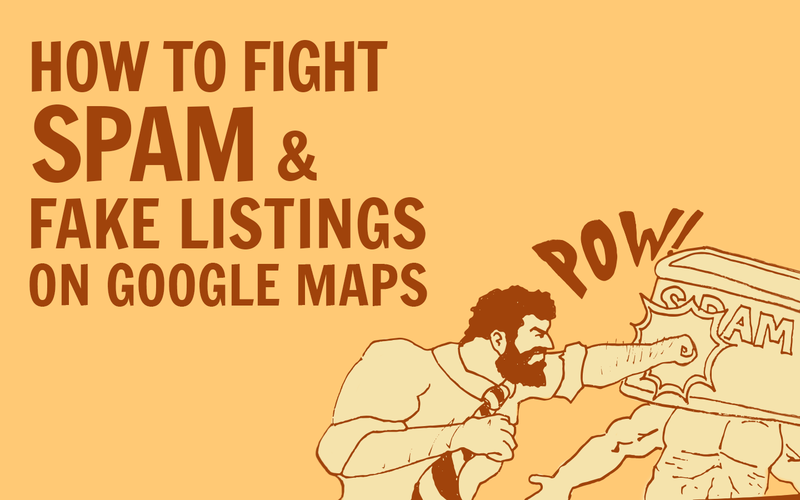 Here’s how you can join Erik, BizIQ, and others in the online marketing and small business communities in the fight against fake reviews, spam, and fake listings on Google Maps. Use the now popular #StopCrapOnTheMap and screenshots of what you discover to report your findings on Twitter. You don’t even have to tweet the hashtag at Google for them to notice. Google actually has people who keep track of the hashtag and will take a look at what you found. You might not see an instant result, but they do take this hashtag seriously, so be patient. Submit your edits to a listing within Google Maps. Like we mentioned above, Google Maps allows you to submit edits including for things like incorrect business names, phone numbers and addresses. You can even alert Google that a location doesn’t exist or that a business is permanently closed this way. Just make sure you’re submitting accurate information. Flag fake reviews for removal directly on the review in Google Maps. You can report fake reviews that a competitor, review seller, or disgruntled employee posted by going to your Google My Business account and following Google’s instructions. You can also flag fake reviews for removal you notice posted by other companies within their listing on Google Maps or the Local listing within Google search results. If it’s on Google Maps, you go to the 3 vertical dots and click on them to report the review. Within Google search results, you can report reviews by clicking on the flag at the top of an individual review within the business’’ local listing. Create a post on one of the forums. If you notice problems with an unverified listing on Google Maps, you can post your findings and get help in the Local Guides forum. If the listing is verified, you can post about it in the Google My Business forum. Make sure you include links to the map listings and create individual posts for individual businesses (not each listing from the same company). Each of the forums has contributors who are authorized by Google to help resolve issues people find or have. In the Local Guides forum, they’re Level 5 Local Guides and in the Google My Business forums they’re called Top Contributors. These people can alert people at Google to the listings and habitual fake review policy violators. There’s no guarantee that Google will suspend a listing or remove the fake reviews you find, but if fake listings and fake reviews are harming your business, you definitely want to report the problem and collect as much information as you can to ensure that the problem will be fixed. You won’t just be helping your own business, but small businesses in general. What if I didn’t know something I did to market my business was against Google guidelines? There’s a lot of misinformation online when it comes to marketing your business. As I already mentioned, you can even find Google Ads from companies that claim to partner with Google who sell services that actually violate Google’s own guidelines and wind up getting these businesses listing’s suspended which means they won’t show up in Google search results. There are ways you can market your small business online that are more effective than shady listings tactics and purchasing fake reviews that are within Google’s guidelines, and that won’t get you removed from search results. If you want to know how to relax and take control of your Google reviews that won’t potentially get your Google My Business listing suspended, head over to our local guides page and download the free e-book on responding to every type of Google review. That way you can relax about any 1-star review you receive and won’t be tempted to buy a pack of fake reviews. If you accidentally did something that’s against Google guidelines when you created or claimed and verified your Google My Business listing, do not continue to do it. If it’s something another digital marketing company recommended you do or did for you, you should probably find another local online marketing company to help you manage your listing. If Google has already suspended your business listing, there are things you can do to fix any issues and to get it reinstated. Watch this video to find out more about Google My Business listing suspensions and how to fix them. Plus at BizIQ, we’re happy to answer any of your questions as well. Click on the chat bubble in the lower right corner to speak with a live marketer – not a robot – right now.